« Congratulations to Professor Yoshiaki Nishibayashi, winner of the JSCC Award for Creative Work! Congratulations to the USIC 2017 prize winners! This August the Universities of Scotland Inorganic Chemistry Conference 2017 (USIC 2017) was held at the University of St Andrews, to great success. It brings together inorganic chemistry students from Scotland and the north of England and featured internationally renowned keynote speakers Claire J. Carmalt, Andrew Goodwin, Robert Tooze, and Piet van Leeuwen as well as a number of speaking slots reserved for student talks. 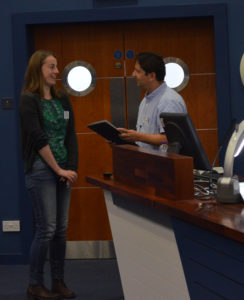 The Dalton Transaction prize for best oral presentation was given to Alice Bumstead at the University of St Andrews for her talk Modulator-Mediated Synthesis and Structural Transformations of an Interpenetrated Zirconium MOF. 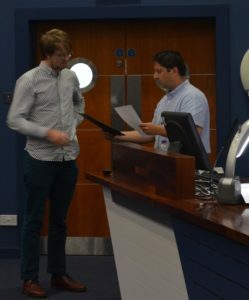 The prize for best poster presentation was awarded to Reuben Leveson-Gower, a recent graduate of Durham University, for his poster entitled Novel Iridium (III) Pincer Complexes. Dalton Transactions offers a huge congratulations to both winners!